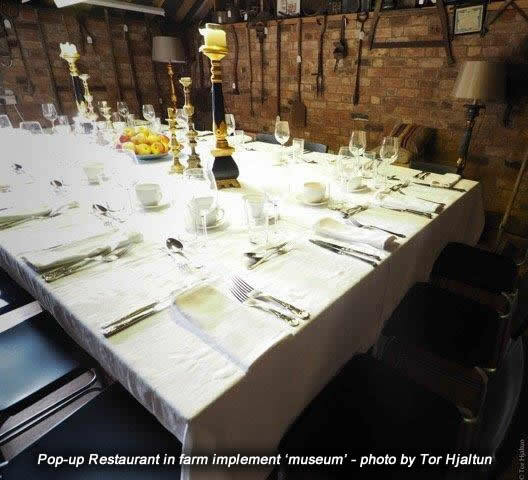 Pop-up restaurants in private houses are the exciting new dining trend which is spreading fast from London to the countryside. Hugh and Louise will be bringing expertise into their home by way of their very own pop-up restaurant and supper club. You won’t feel like you are going to a restaurant, often paying through the nose for an average meal, but more like an organised dinner party where you are paying for really good food. You will be invited into their home to sample not only Louise’s cooking but also their 16th century farmhouse which is nestled in the Suffolk countryside. It is a ‘bring your own bottle’ affair which means they can keep the price at £25 per head for a 4 course meal preceded by ample canapés and ending with coffee and petit fours. Pop-up restaurants and supper clubs are great for tourists and those who want to meet new people. You socialise in a way that you never would in a restaurant and, in general, people seem to behave better in another person’s home! On arrival you will be greeted by Hugh whose legendary front of house skills will come to the fore during the evening. Louise sources all her food locally and her menus will be made up from as much seasonal produce as possible. You will begin the evening with a complimentary home-made damson vodka cocktail along with canapés in their delightful timber framed drawing room, sitting room and dining room with open fireplaces before moving to the converted shed which houses a farm implement museum and snooker table dining area seating 18-20 guests. There is also room for a further 10 guests in the farmhouse’s beautiful dining room. In the summer months canapés will be taken in the glorious garden & orchard & dining can also take place al fresco under the vine clad pergola where many more guests can be accommodated. The summer months sees pop-up picnics which can be ordered by telephoning or emailing Louise and can be enjoyed in the long grass meadow, the swing-seat-with-a-view, the damson patio or the summer house. This is a really exciting time for food in this country so please contact Louise’s Kitchen Pop-up Restaurant and sign up to receive regular email updates. Louise is registered with St Edmundsbury Borough Council Food Standards Agency and has the maximum food hygiene rating possible, 5/5, the Certificate of which is proudly displayed in her kitchen. Guests are responsible for their own safety and belongings such as cars, bicycles and handbags.